The TV Input Framework (TIF) manager works with the audio routing API to support flexible audio path changes. When a System on Chip (SoC) implements the TV hardware abstraction layer (HAL), each TV input (HDMI IN, Tuner, etc.) provides TvInputHardwareInfo that specifies AudioPort information for audio type and address. Physical audio input/output devices have a corresponding AudioPort. Software audio output/input streams are represented as AudioMixPort (child class of AudioPort). The TIF then uses AudioPort information for the audio routing API. TV Audio Input has a corresponding audio source port implementation. TV Audio Output has a corresponding audio sink port implementation. 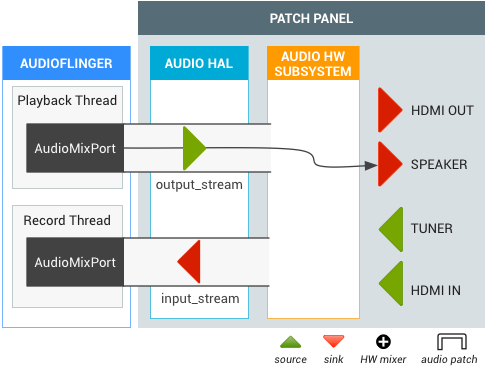 Can create audio patch between any TV input audio port and any TV output audio port. AudioRecord (created with DEFAULT input source) must seize virtual null input source for AUDIO_DEVICE_IN_DEFAULT acquisition on Android TV. Requires supporting an AUDIO_DEVICE_IN_LOOPBACK input that is a complete mix of all audio output of all the TV output (11Khz, 16bit mono or 48Khz, 16bit mono). Used only for audio capture. Android supports the following audio devices for TV audio input/output. /* Creates an audio patch between several source and sink ports. /* Fills the list of supported attributes for a given audio port. * needed by the HAL to identify the port. * channel masks, gain controllers...) for this port. To test DEVICE_IN_LOOPBACK for TV monitoring, use the following testing code. After running the test, the captured audio saves to /sdcard/record_loopback.raw, where you can listen to it using FFmpeg. This section includes common use cases for TV audio. When a TV tuner becomes active, the audio routing API creates an audio patch between the tuner and the default output (e.g. the speaker). The tuner output does not require decoding, but final audio output is mixed with software output_stream. Figure 2. 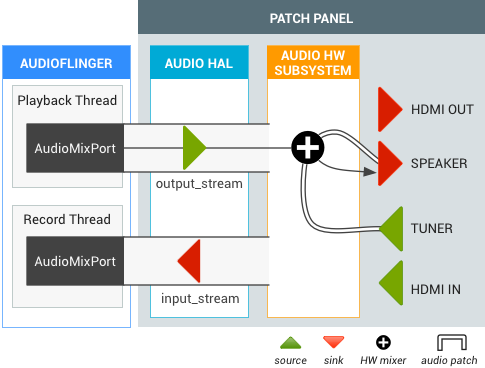 Audio Patch for TV tuner with speaker output. A user is watching live TV then switches to the HDMI audio output (Intent.ACTION_HDMI_AUDIO_PLUG) . The output device of all output_streams changes to the HDMI_OUT port, and the TIF manager changes the sink port of the existing tuner audio patch to the HDMI_OUT port. Figure 3. Audio Patch for HDMI OUT from live TV.